Following a major multi-million pound redevelopment in 2009, our 1,250 seat concert hall is state-of-the-art and fit for the 21st Century. 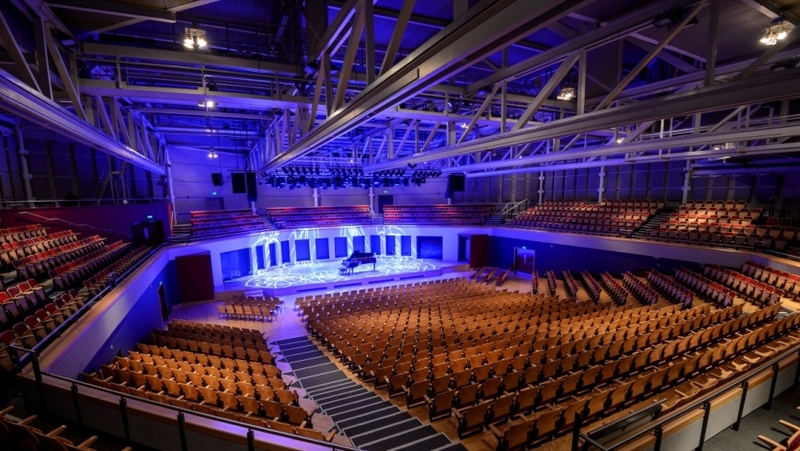 A new hydraulic stage, improved acoustics and full wheelchair access were added, along with brand new technical equipment. If using the venue for an exhibition or special event, the hydraulic seating rake moves back to reveal 525sq.m of flat floor space. In addition, we can provide a stunning new rehearsal/performance space, dressing rooms and band rooms for artists and performers and a kitchen for event preparation. Download floor plan of seated layout for detailed information on wheelchair spaces, flat floor access, handrails, and the number of steps between rows.